1st decade- Das Buch is released at the frankfurt book fair in october ´98. inverse publishing : "1st decade"-Das Buch was edited completely in html in frankfurt and later imported into quark in vienna. the 10-year-history of station rose hypermedia. The historical facts are presented as a documentary report & in the typical graphical STR-style, including original documents, PR clips, icons, morphs, samples & texts. moments in time - like e.g. the viennese phase (morphing the city from postmodern to digital), cairo or cyberspace/frankfurt - are made transparent with narrative sequences, combined with evidence out of station rose´s "digital archive". The "digital archive" provides an enormous amount of data, let STR grab what they needed: multimedia field-research in egypt with a little help of GUNAFA, multimedia field-research in california 1991/92/95, their connection with the german techno scene since 91, digital cocooning experience & their virtual community, cd s & cdroms with a major company. the media/art theory concerning Station Rose has been provided by writers who know STR´s work from the startup sequence in vienna until now = LAH/Life After History. 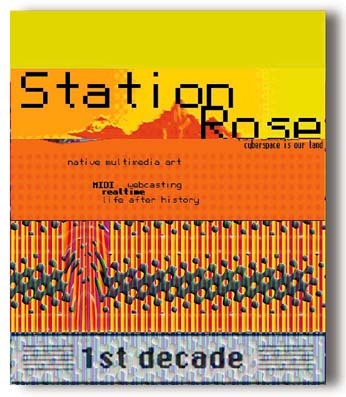 Book No.1 on the 10-year-history of station rose hypermedia. texts by Elisa Rose, Gary Danner, F.E.Rakuschan, Timothy Leary, Geert Lovink, Thomas Hettche, Petra Klaus, Micky Remann, David Hudson, Terence McKenna, Michael Behrendt, Bea Stammer/Gabriele Horn, Howard Rheingold, Christoph Tannert, Fett Tedget, Micky Kwella. The book was interely programmed in html by Station Rose & can now be seen as the basis of the Digital Archive.